Hardback, 1st UK edn. The chilling confessions of James Maybrick. A book which unfolds a terrible Victorian tale of jealousy, depravity and love. The story of the horrific acts of drug-taking, and womanising of 49-yr. old Liverpool cotton merchant, James Maybrick, and of his 26-yr. old American wife, Florence, wrongly convicted of her husband's murder. Scholars and scientists alike agree on the Diary's historic importance, and since it surfaced, researchers have worked continuously to uncover the truth. A horrifying insight into the real life of Jack the Ripper. Is it genuine? Read the evidence for yourself. 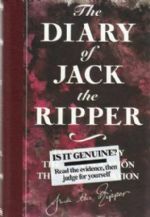 With Facsimile of the Diary of Jack the Ripper, Transcripts of the Diary of Jack the Ripper. Illus., Index. 299pp. 8vo. h/back. As New. dw not required. Shirley Harrison was a contributor to the Grey House Books publication 'Who Was Jack the Ripper? A Collection of Present-Day Theories and Observations'. A fairly heavy book which may require additional postage if shipped overseas.